I have been in the meat business for over thirty years. I started as an apprentice meat cutter and worked my way up to a variety of positions including, meat manager, buyer, merchandiser, and for the past seven years, owner of my own meat market. I have always enjoyed grilling over the years. When I bought my meat market, I realized I had the best meats to offer grillers and that really sparked and heightened my interest in grilling. I started reading more about grilling, different techniques, fuel types and began experimenting with my new found knowledge. Through trial and error, learning from my mistakes, my passion and persistence grew. I enjoy grilling on many different grills, including my Genesis, Performer, Smokey Joe, and Q 1200. The Genesis is great during the week for something quick and easy when you don’t have much time. I use the Performer more during the weekends, when I have more time to tend to the live fire. I keep the Q 1200 at the meat market to enjoy some delicious grilled lunches. I enjoy grilling a variety of meat, seafood and vegetables on my grills and I recently started grilling pizzas from scratch. My friends and family always enjoy coming to our place to eat. There is always something delicious coming off the grill. For my family holiday dinner, I always grill two whole beef tenderloins. This is a family favorite and a traditional meal in our home. Everyone goes up for second helpings and there are not many left overs. What I love about beef tenderloin is that it cooks up very quick and has a great presentation with no waste and no fat or bones to deal with. I always tell people to season it with olive oil, salt/pepper, sear the entire roast on your grill over direct, medium heat; then move to indirect medium heat (350-450F) for approximately 20-30 minutes. It’s amazing served with a roasted shallot sauce. Prime rib is a traditional cut. It has a huge presentation when put on the table. It is very tender. My best advice for cooking the prime rib is to rub it with olive oil, salt/pepper, then cut several slits and insert garlic. Roast over indirect, medium heat (350-450F) for approximately 12-14 minutes per pound. If you roast a full seven rib roast (18lb), it will be 3 ½ to 4 hours. Pork roasts are great because there are a few different varieties to choose from. 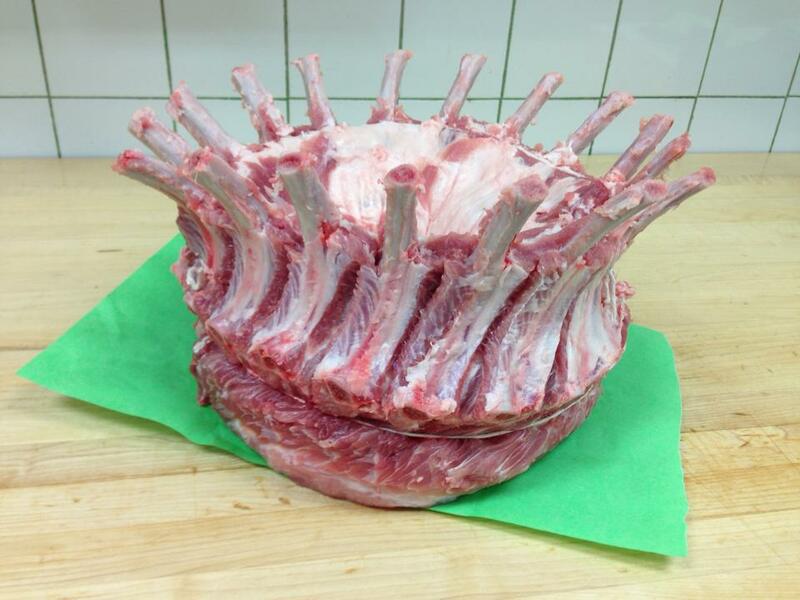 Crown roast has the biggest WOW factor when set on the table. Bone-in and boneless pork roasts are other great options. The meat is tender and flavorful. Pork needs seasoning to bring out the flavor. Bavarian seasoning (blend of brown mustard seed, thyme, garlic, rosemary, sage, and bay leaves) is a great option. Roast on your grill indirect, medium heat (350-450F). A 5lb bone-in roast would take about 1 ¾ hours. Rack of Lamb is a terrific option for a small crowd. One rack generally feeds two people. Lamb has a unique flavor and presentation. It’s best seasoned with olive oil, salt/pepper, garlic and oregano. Sear on direct, medium heat (350-450F), turning once, then move to indirect for 10-15 minutes. A fresh Amish turkey is a holiday favorite. Turkey can be prepared in many different ways and can serve a small or large crowd depending on the size. I always recommend brining a fresh turkey. Butter and season to your liking. I like to put the breast side down first for the first hour then flip and finish. Grill indirect, low to medium heat (300-350F) for an unstuffed 10-12 lb. turkey, it would be about 3 hours. Internal temp will be 165.